Russell T. Davies is primarily known for his work within the Doctor Who universe. Not only did he restart the long-running British sci-fi series in 2005, but he gave it two spinoffs: Torchwood and The Sarah Jane Adventures. But prior to Who, Davies had headed up some other pretty iconic shows. 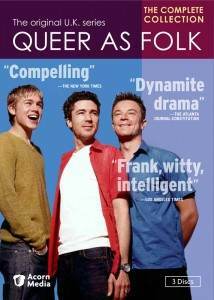 Case in point: 1999’s Queer As Folk. As a straight male, I don’t really think that I’m quite the intended audience for the show. It is, after all, about two hard-partying gay friends who have relationship problems. Stuart (Aiden Gillen, Game of Thrones) is all about the one-night stands, while his best friend Vince (Craig Kelly) has less luck finding love. Fifteen-year-old Nathan (Charlie Hunnam, Sons of Anarchy) enters their lives and serves, in a way, as a catalyst to help Stuart and Vince get out of their respective ruts. The show is stiflingly camp at times, but Davies’ characteristic lack of subtlety is more than made up for by his brilliant characterization, bolstered by some fantastic performances. Aiden Gillen, who would go on to star as Tommy Carcetti on The Wire and Petyr “Littlefinger” Baelish on Game of Thrones, is an absolutely magnetic presence as Stuart Alan Jones. Charlie Hunnam, who now stars as Jax on Sons of Anarchy, also delivers a fascinating performance. Craig Kelly is the least talented of the three leads, but he’s still passable as Stuart’s best friend Vince. The show’s also interesting as a bit of a time capsule. It wrapped up a full five years before Davies resurrected Doctor Who, but there are plenty of references to the series — in fact, in one of the show’s funniest scenes, Vince rejects a man who is unable to name all seven actors who played the Doctor (the eighth doesn’t count, he argues). The ten-episode series hit DVD on September 27 with a two-disc set. It’s not a show for everyone, but Davies, Gillen, and Hunnam are on top form. Order it on Amazon.